A small Singer Model 24 above is one of our oldest portable electrics. It has an automatic tension device mounted on the top right and derives the Automatic in its name from this feature. The motor swings around and out of the way of the carrying case lid. It has "Small Flowers" decorator pattern and has a decorated black cloth plate while some are silver. 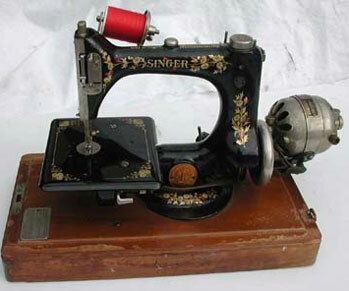 This is a chain-stitch machine. Using only one thread, it was a simple matter to tug on one end of the thread and rip out the entire seam. For this reason, seamstresses fastened the final stitch with a knot. We haven't done a lot of research on this machine nor have we tried to sew with it. It is quite possible this head was made for either treadle or to be electrified as shown here. We are reluctant to plug in the motor because of its age. This is another very nice machine we have that just sits for now in its domed wood carrying case. Needle bar site http://www.needlebar.com/singer24/parts/index.html has a good description of the Model 24-4. There a number of variants of this machine made for treadle, handcrank or electrified like the one above.